The Tough Director PLC is a revolutionary design in PLCs that is causing a paradigm shift in PLCs. It is an advanced PLC which will normally be classified as a high end PLC by our competitors. It certainly is more powerful than the SLC500 series from Allen-Bradley, more powerful than the DL205 series from Automationdirect and more powerful than the Premium Series from Schneider, but at the price of their Pico or Nano PLCs. This is a High-end PLC because it is expandable from 8 I/O points to 2048 I/O points, it has a large 64K byte memory for program and data storage, it has 8192 registers, it can handle 8192 variables, it has 32 bit floating point math, it has 8 autotuned PID loops, it has world class modular and plug-in I/O, it has great communication capabilities to interlink with Profibus, DeviceNet and Modbus Networks. In fact the Tough Director PLC can act as a Master or Slave under software control on both Modbus RTU as well as Modbus TCP/IP. On top of all this, the Tough Director PLC is blazing fast. It sports 3 ms scantime for 1000 NO instructions including all overhead, and respond to an external interrupt in less than 40µs. In addition to all these high-end features, the Tough Director PLC is introducing a number of new revolutionary concepts. it has an incredibly easy programming software featuring Drag-n-Drop as well as our Patent Pending Free Flow Ladder Logic. It is also extremely light weight in construction, yet it has the reliability of an extremely rugged PLC used for military and defence applications. It has gone through HALT/HASS testing subjecting it to 10g of shock and 10°C temperature gradient simultaneously. This innovative design departs from the traditional back-plane construction into which I/O modules and CPU plug into the back-plane. In EZPLC, we have the motherboard with built-in CPU, power supply as well as communication modules. The motherboard itself can be easily replaced in the field. The I/O modules are compact little cubes in 24 different varieties designed to give you the highest level of functionality in the smallest space and at a price which is 1/5th to 1/10th of competition. 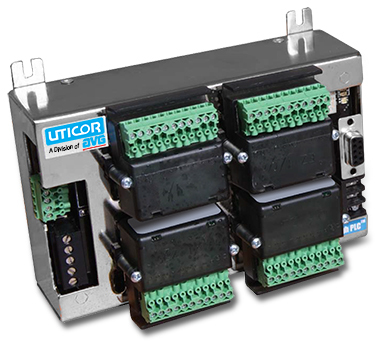 Instead of the traditional edge connectors that allows the I/O modules to be mounted vertically into the PLC rack, this Patent Pending new design mounts on to the motherboard in a horizontal plane allowing latest advances in SMT manufacturing technology to produce extremely cost effective PLC I/O and can be seen from our prices.